Green World Rising (GWR) has produced a series of short films on the state of climate and solutions to the climate crisis. All the films of Green World Rising are for global distribution, free to the public and hold a Creative Commons License Attribution-NonCommercial-Share Alike 4.0 International. GWR is funded by the Leonardo DiCaprio Foundation and produced by Tree Media. The series is narrated by Leonardo DiCaprio, presented by Thom Hartmann and directed by Leila Conners. Executive Producers are George DiCaprio, Earl Katz and Roee Sharon Peled, and produced by Mathew Schmid. Episode 1 – Carbon shows how we can keep carbon in the ground by putting a price on carbon. The other films are less relevent here, but are available on youtube, Episode 2 – Green World Rising, Episode 3 – Restoration, and Episode 4 – Last Hours. On the GWR web site, “Pressure your Politicians“, is one of six options for, “Taking Meaningful Action.” To pressure your politicians, review members of Congress’s voting records, and ask them to take bold action on climate change. It does not suggest any particular climate policy. Let’s apply the CarbonTax Workshop (CTW) metric to Green World Rising’s (GWR) eight minute video, “Carbon“. GWR does a fair job communicating the need for a price on carbon to keep fossil fuels in the ground. The video does not explain how a carbon tax works, or that its the cheapest, simplest, and most effective market-based solution. Score: 6. GWR’s mentions that some countries, and Boulder Colorado, have implemented a carbon tax, but then implies that the Obama administration and the “Federal government” will not. Whoops. Congress is the branch that handles taxes. The video then explains that since the federal government won’t take action, the states and cities must install renewable energy. It would be much more effective for cities and states to implement a carbon tax. 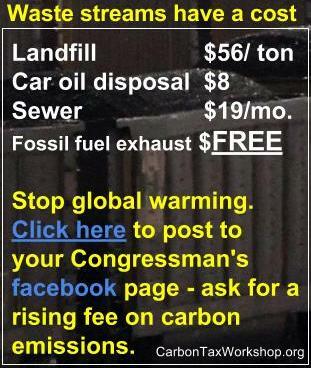 The video does not instruct viewers to contact their members of Congress to demand a carbon tax. Score: 1. GWR videos are freely available on youtube and as of 9/26/14, “Carbon” has 58,000 views. CTW would like to see the film’s producers fix the script flaws described in 2 above, put $1M into marketing, and push their view count up into the millions. Score: 5. Overall CTW score is 12. This big name short-film format has potential, however, this particular instance has fixable script problems. CTW hopes to see additional quality videos like this, with even a tighter and more detailed focus on carbon tax.